Fun show! These are my soul-filling gigs. 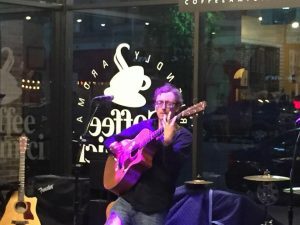 Mike Gentry played a full set of original songs and shared stories about living in LA, Crazy Johnnie, and how we are all “one water.” Then I played a full set of mostly songs from A World That’s Bigger. I played one unreleased song, “Awestruck,” and three covers, too. Thanks to the returning faces for coming out to our favorite Ohio coffeehouse listening room. And thanks to Lynne, John, Craig and Jayne for hosting us.